Martial Views: Karate or Karate-Kobudo? Recently I found myself training at a Matsubayashi Shorin-ryu school working indigenous Okinawan weapons: kobudo. The chief instructor asked me to advance with my bo (staff) while paired up with another trainee, so I instinctively stepped forward using a cross-stepping kosa-dachi. I'm told Shorin-ryu stylists don't (or quite rarely) utilize this stepping scheme into their bo training so this sparked some counterpoint on the matter. The next topic of discussion was much broader: As karateka why should we even bother with kobudo? Given the vast catalogue of karate techniques one must master there seems to be little time left available for Okinawan weapons training. Kobudo is a martial art unto itself, not something that needs to be hyphenated with karate, a practical form of self-defense. Okinawan karate by default includes kobudo, for the most part; Japanese styles such as Shotokan do not officially incorporate any weapons into its syllabus. 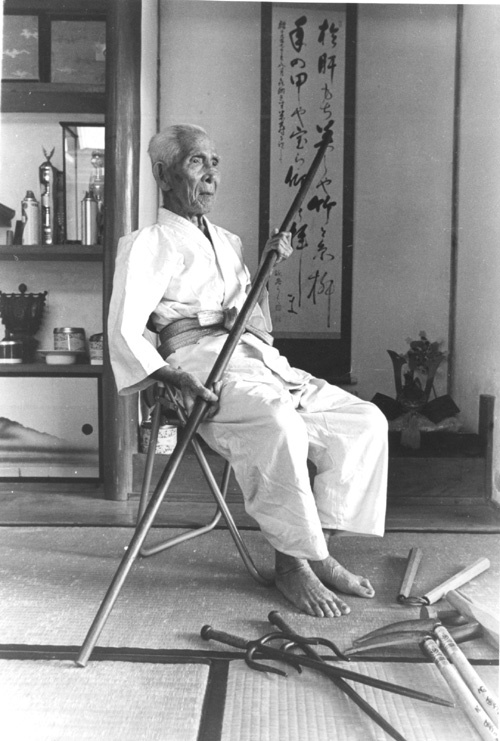 When Tatsuo Shimabuku was codifying Isshinryu karate in the late 50s he began his training in kobudo arts with the eminent weapons master Taira Shinken. Thus Isshinryu karate and kobudo was born. Whether Shimabuku did this keep up with his Okinawan contemporaries who were doing the same (possibly more for cultural than practical reasons) or to distance his new "maverick" style from mainland Japanese stylists who had renounced weapons training is unclear. At any rate, Isshinryu karate that does not include kobudo is not Isshinryu the art, strictly speaking. An Isshinryu instructor I know with a long list of credentials holds the rank of 5th dan in Matayoshi kobudo, a system that includes sai, tonfa, bo, eaku, kama, nunchaku and some other weapons I'm not familiar with. The principles and methodology taught in the Matayoshi system are somewhat different from Isshinryu kobudo. In Ufuchiku kobujutsu a total of twenty-five weapons are taught. Now that's quite a catalogue. Certainly it takes considerable time to become adept at handling a single weapon, let alone two dozen. The point being is that if you're training in karate and it includes kobudo, something is going to get short shrift -- and it probably won't be the karate.